December 9, 2013, 11:58 AM · We began our last trip to Walt Disney World with a trip to the much hyped Kona Café in Disney's Polynesian Resort. This smaller and open-air restaurant seems to have been created for overflow from the famous Ohana, but this restaurant has created a reputation for its breakfast. When we arrived, we were promptly seated, but the place was full of people. We didn’t feel claustrophobic, but I could see some guests feeling a little close to each other in certain areas of the place. Reservations were not hard to get, but there were very few walk ups that were able to find openings. We started our breakfast with some Kona Coffee and some Liliko’i Juice which was made with Orange, Passion Fruit, and Guava. My mother works at Whole Foods coffee section so she is familiar with Kona Coffee and she said that this was some of the best she ever had. My Liliko’I Juice was a little warm, but I didn’t mind because it told me that this was squeezed and made to order. It was one of the best juices I have ever had. Very tasty! The main reason why I wanted to come here is the (Walt Disney) world famous Tonga Toast, a French Toast concoction that has been named best breakfast items by other travel and Disney websites. It is a banana stuffed sourdough French toast rolled in cinnamon sugar and topped with strawberry compote. Now, I am usually not a fan of French Toast since it is usually pretty soggy, but the Tonga Toast came out crunchy and left the softness to the fresh bananas in the middle. This dish lives up to its reputation. It was one of the most unusual and delicious items I have ever eaten for breakfast. It was outstanding without the compote, but adding it gave more flavors to the dish. It also came with a choice of a side (I got bacon). My parents decided to share the Big Kahuna and it probably was a good idea. It was huge! It included French Toast (not Tonga), Pancakes topped with pineapple sauce, eggs, potatoes, ham, sausage, and bacon. I got to taste everything on this dish and the pancakes were really good. I am surprised that this is a dish for one person because it was easily enough for my two parents. If neither of these items sound like your kind of breakfast, do not worry. Kona Café also has omelets, steak and eggs, and pancakes to name a few. What we really liked about Kona Café is we felt that the pricing for what you got was very good. Sure, you are still at Disney World, but the food did not appear to be overpriced. The Tonga Toast and Big Kahuna was around $13. If you are looking for a breakfast place that is really good and has more than just the common bacon and eggs, I highly recommend checking this place out! If you don’t want to sit down and just are looking for some pastries and Kona Coffee, they do have a quick service right next to the restaurant. Sorry, no Tonga Toast there! December 9, 2013 at 2:01 PM · That bacon with the Tonga looks perfect. December 9, 2013 at 6:58 PM · I'm intrigued by the tonga toast!, I've never heard of it before, but it sounds good. December 9, 2013 at 7:03 PM · I'm so happy you reviewed the Tonga toast! I have been very curious about it and wondered if we should try it on our next trip. I too am not a huge fan of French toast, though I fell in love with Pooh's puffed French toast at the Crystal Palace. Will definitely try Kona Cafe on the next trip. December 9, 2013 at 7:06 PM · I don't know if I'm more heart-broken or upset with you for not mentioning The Samoan! Oh my god, my wife and I are in love with that dish. 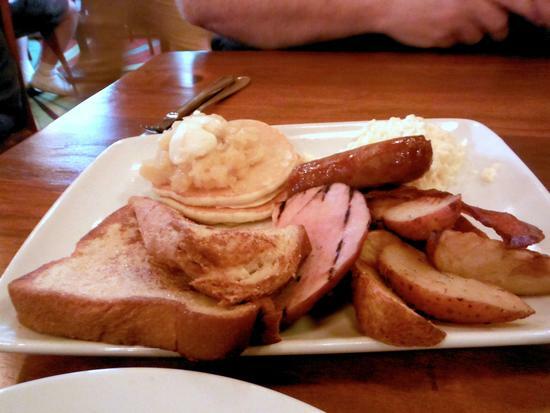 We both think it's the best single breakfast dish in all of Walt Disney World. And you didn't even show a picture of it! 2. I can't recommend Tonga Toast enough! I am a big Bacon and Eggs guy, but this was worth it. It tasted like bananas between cinnamon toast crunch with the freshest strawberry sauce put on top! 3. My parents almost got the Samoan, but went with the platter so that they can try as many things as possible. There seems to be way too many good things on the menu and we are only talking breakfast here! 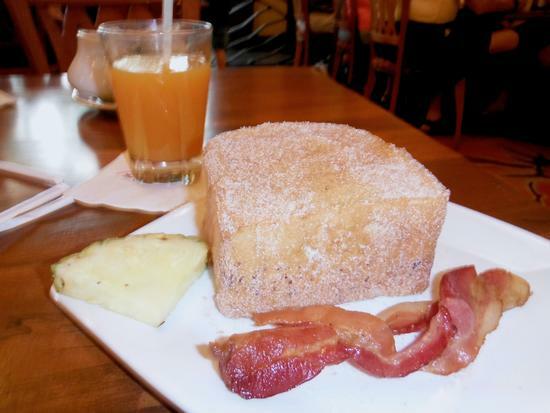 December 9, 2013 at 10:43 PM · The Tonga Toast is delicious, I can't wait to try it again! December 9, 2013 at 11:33 PM · Meats on sticks at Ohana is still one of my favorite vacation meals of all time. December 10, 2013 at 10:59 AM · Even better than the Tonga Toast or the Samoan, I love the Macadamia Pineapple Pancakes. Your parents got a sample of them on the Big Kahuna they ordered, but the large portion is perfect for the person wanting to get a nice, sugary start to the morning. Nothing like a quick burst of short lived energy to prepare you for that mid afternoon crash at the resort.